Our Luxurious Lotion is non-greasy & fast absorbing, yet leaves your skin feeling unbelieveably soft & smooth! Great on the face, hands & body! Our lotion is packed with moisturizing natural ingredients such as Cocoa Butter, Shea Butter, Vitamin E and Botanicals. Comes in a bottle with a pump for easy application. Pick which 3 scents you would like. 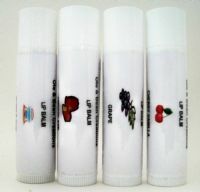 Our moisturizing lip balms are infused with shea butter, cocoa butter and Vitamin E. Many flavors to chose from. Start your lip balm addiction today! Pick the 3 flavors that you would like to receive.